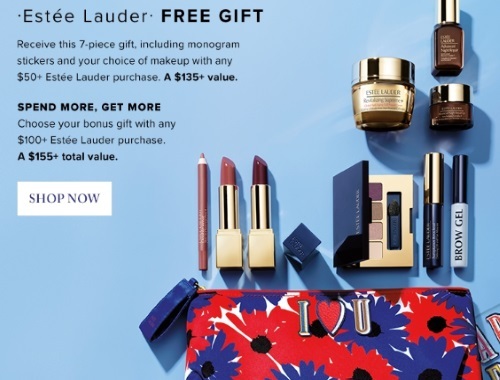 Hudson's Bay has a new Estee Lauder Free Gift With Purchase! Receive a 7 piece gift including monogrammed stickers and your choice of makeup with any $50+ Estee Lauder purchase (a $135 value. Spend more and get more, chose a bonus gift with any $100+ Estee Lauder purchase (a $155 value). Offer is available for a limited time. 1 gift per customer.